It’s another hot day today. And I guess it’s going to be another hot night tonight. Actually I didn’t sleep well last night. I was tossing and turning in bed for hours. 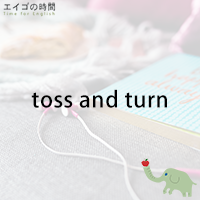 Are you familiar with the expression “tossing and turning”? According to the Macmillan Dictionary, to toss and turn means to be unable to sleep, or to sleep badly, especially because something is worrying you. It can be anything. You may be having trouble with a friend or at work. Or it’s just too hot to sleep. Whatever the reason, you’re restless, moving around from side to side or tuning a lot in bed. That’s tossing and turning. I don’t want you to spend a night tossing and turning. But when you do have a night like that, you may want to know how to express it. Tossing and turning.